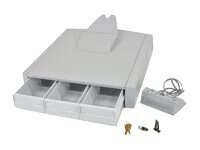 Upgrade a non-drawer non-powered cart for medication delivery with this drawer assembly. Triple version provides three separate small drawers. Contains all parts needed to create an auto-locking drawer system. Individual drawers are easily removed for stocking and cleaning. Configure the interior of each drawer to suit your needs using the provided dividers. Max weight capacity of 0.3 pounds (maximum load per individual small drawer).